Following Sony's IFA 2010 press conference earlier this week, the consumer electronics giant has revealed its first 3D Vaio laptop. No official word yet from Sony on plans for a commercial release, but we've reached out to Sony UK and expect to hear more on that front very soon. A Sony rep at IFA said that he expects the new Vaio should arrive at some point early in 2011. The 3D Vaio prototype on display at IFA had a 16-inch screen, with Sony claiming that its 3D laptops will feature extremely fast-response LCD screens displaying up to 240fps, giving a better 3D imaging than competing products already on the market. The Vaio 3D laptops will use similar 3D tech to Sony Bravia TVs, including Sony's 'Black Frame Insertion' which gives the viewer extra clear and super sharp results, by inserting black frames between colour images to separate them. Full HD, as one would expect, as well as the use of the frame-sequential 3D display method to deliver full HD images to each of your eyes via the same Sony-branded active shutter glasses that are used to view 3D Bravia TVs. 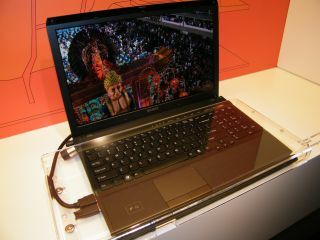 The Vaio on display had a one-touch 2D to 3D switch, a Blu-ray drive and offers the ability to upscale from 2D to 3D. Stay tuned for lots more IFA news as it breaks throughout the day.